Everyone’s got a secret, and you’ve been hired to sniff them out. I’ve landed a job as the caretaker of an apartment block. At least that’s my cover story. I’ve actually been hired by the government to spy on the people who live there. A phone in the basement rings and the Ministry orders me to keep tabs on Jacob Manishek, a tenant in apartment 2. They don’t say why, but they’re obviously suspicious about something. I watch his apartment from afar and wait for him to leave for the day. When he’s gone I use my master key to slip inside and hide a security camera in a smoke alarm. This means I can watch him even when I’m outside, although only in a small radius. Later I’ll be able to upgrade to cameras with a wider field of view, but for now this is all I have to work with. Before I leave I look through Manishek’s belongings for clues about what the Ministry might suspect him of. I find some evidence of gambling, but as of now there’s no government directive saying that’s illegal. That could change, though. Directives come through constantly: things like banning certain books or the use of foreign currency. And they must be obeyed. I leave and wait patiently for Manishek to return home. I could look through his keyhole for a clearer view, but there’s a chance another tenant will see me and blow my cover. So I watch the camera feed, which shows only a small sliver of the room. Nothing happens and Manishek goes down to the kitchen for food. I approach him and introduce myself as the new caretaker, but he’s incredibly rude and doesn’t seem keen to talk to me. More watching and waiting, until Manishek finally slips up. Under the glare of the camera I see him making drugs on a table. A clear violation of directive 6040. I return to my apartment and write up a report, using the evidence I’ve collected. If I mess the form up even slightly I’ll be fined, so I make sure every detail is correct. Then I send over to the Ministry. A few minutes later I hear the rumble of an engine. A police van pulls up outside the apartment and two intimidating-looking officers get out. One storms over to Manishek’s apartment, kicks the door down, and beats him savagely with a club. Then he’s dragged away, bundled into the wagon, and taken back to the Ministry for, well, probably something unpleasant. I’m paid handsomely for fulfilling my civic duty. You could argue that Manishek deserved his punishment. But does anyone really deserve to be spied on by their government? That’s one of the many questions raised by Beholder. And later your morals will be tested more firmly. You’ll be asked to spy on people who you’re friendly with, or who helped your daughter find her lost doll. And you’ll realise that maybe they haven’t done anything bad at all, and the Ministry just wants them silenced. Do you do the right thing and turn a blind eye to their misdemeanours? Or do you risk your job and your family’s lives by disobeying your superiors? Beholder is out now on PC. 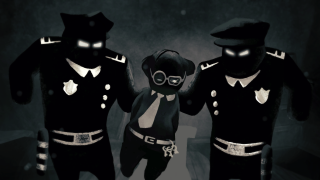 It’s one of the darkest games I’ve played in some time, like Papers, Please meets The Lives of Others. I’ll need to play more to get an idea of just how difficult these moral dilemmas get, but from what I’ve seen so far it’s an intriguing game with beautifully stylish art and an eerie, paranoid atmosphere. Watching that cop beating Manishek half to death as a result of my state-sanctioned prying was surprisingly difficult to stomach, even if he was breaking the law. It’s not often that games make me feel genuinely unsettled, and that alone made Beholder worth playing.